Dumore Motors DR500 custom fractional horsepower permanent magnet DC right angle worm drive gear motors are flexible, heavy duty, double or single reduction worm drive right angle gear motors rated to 500 inch lbs continuous torque. 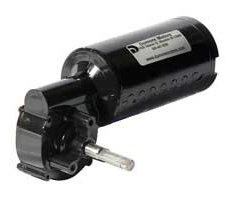 The DR500 custom permanent magnet DC right angle gear motors are powered by Dumore Motors DM32 or DM40 permanent magnet DC motors in voltages from 12 to 240 VDC with output speeds from 6 to 58 rpm. Dumore Motors right angle gear motors are fully customized specifically for your application, so you get the gear motor you need at the price you expect! Contact Dumore Motors and let one of our engineers help you select and customize the exact right angle gear motor you need for your application. Learn more about how Dumore Motors custom right angle gear motors are recognized worldwide for unparalleled precision and quality craftsmanship, and why our customers say our service sets us apart from competition! At Dumore Motors, we make finding the right custom gear motor simple!